Direct Boxes at HAVE, Inc. 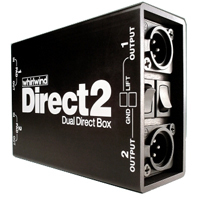 Direct Boxes are mainly used to convert unbalanced or high impedance electronic instrument signals into formats that can directly connect to mixing consoles without having to use a microphone. DI's convert high impedance signals to low impedance signals, convert unbalanced signals to balanced signals, reduces high instrument or line level signals to levels suitable for mixing consoles, and they isolate electronic instruments or equipment from the mixing console to help eliminate RFI and noise caused by ground loops.